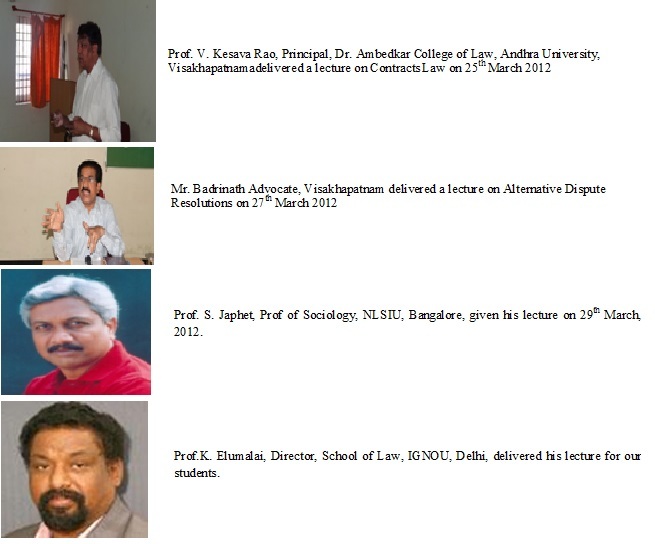 Guest Lecture on “Challenges and Prospects in Legal Profession” by Shri. 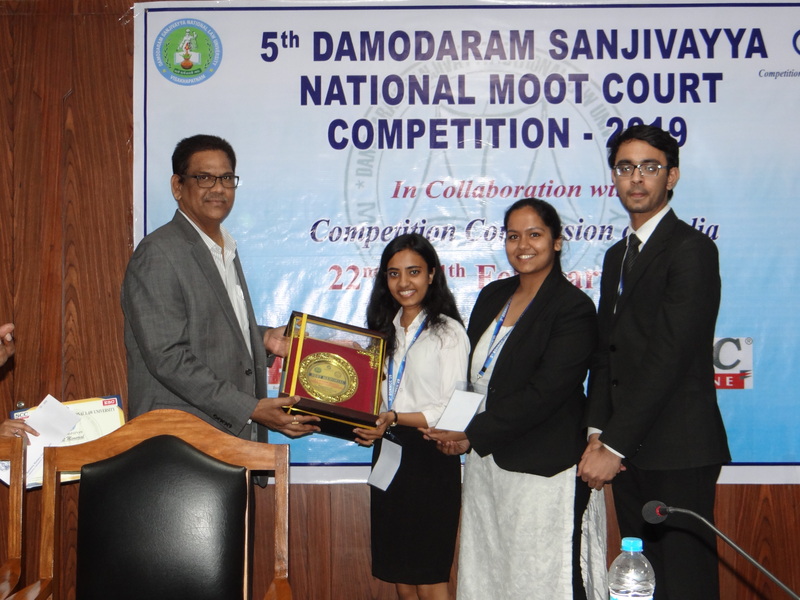 A.Satya Prasad, Former Additional Advocate General and Senior Advocate, High Court of Andhra Pradesh. 1. Prof. (Dr.) R Venkat Rao Vice-Chancellor, NLSIU Bangalore delivered an Orientation lecture for newly admitted students of DSNLU on 11th July 2017. 2. Dr. Deepa Mohan, Associate Professor, Department of Applied Psychology (Psychologist), GITAM University on Overcoming the Weakness – To Strengthen the Positive Attitude on 17th August 2017. 3. Dr. T.S.N. Sastry delivered a lecture on Significance of Private International Law in the Globalized Economic World on 4th September 2017. 4. Prof. KhushalVibhute addressed the students on Research Methodology on 4th September 2017. 6. Preparation for career in Judiciary and Role as a Judicial Officer on 4th& 5th October 2017. 1. Shri. MilindSathe, Senior Advocate, Bombay High Court, Mumbai delivered an orientation Programme for newly admitted first year students on 11th July 2016. 3. 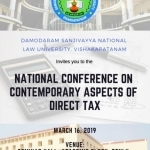 Ms. Priyanka Anand, Assistant Professor of Law NLUO, Cuttack delivered a lecture on Taxation Law for seventh semester students on 18th July, 2016. 4. Padma Bhushan Sri. P.P. Rao, Senior Advocate, Supreme Court of India delivered a lecture on Constitution, State of the Nation and the Legal Fraternity on 6th August 2016. 5. Prof. Jane K. Winn, School of Law, University of Washington addressed the students on Mobile Payments and Financial Inclusion: Kenya, Brazil and India as Case Studies on 20th August 2016. 6. 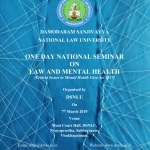 Dr. A. Aruna Sri Lakshmi, Associate Professor of Law, National Law University, Odisha addressed students Strikes, Lock-outs, Lay-off and Retrenchment in Industrial Dispute Act, 1947 on 20th August 2016. 7. Dr. Prabhakar Singh, Associate Professor, OP Jindal Global University addressed on “Sino-Indian approaches to international law: of Nations, states and colonial hangover” on 22nd August 2016. 9. Ms. PramilaHalgeri addressed the students on Power of personal Appearance (Clothes Power, grooving, body Language and etiquette) and Result oriented Communication (Verbal, Vocal and Visual) from 1st & 2nd September 2016. 10. Hon’ble Justice Datuk Dr. Haji Hamid Sultan bin Abu Backer, Judge, Court of Appeal, Malaysia addressed the students on Constitutional Oath, Rule of Law and Judicial Review, Global Development of Islamic Banking and Bonds (Sukuk) on 21st& 22nd September 2016. 11. Shri. R.V. Naga Sundar, Secretary, District Legal Services Authority & Senior Civil Judge, District Court, Visakhapatnam delivered a lecture on Fundamental Rights, Drug Abuse and Anti-Ragging on5th October 2016. 12. Dr. KondaiahJonnalagadda, Associate Professor of Law, National Law University, Odisha delivered lectures on Corporate Law & Investment, Securities & Competition Law from 12th&13th November 2016. 13. Hon’ble Dr. Justice U.Durga Prasad, Judge, High Court of Judicature at Hyderabad for the State of Telangana and the State of Andhra Pradesh on Appreciation of Evidence on 18th March 2017. 14. Dr. Ashish Bharadwaj, Assistant Professor and Co- Director of the Jindal Initiative for Research on IP & Competition (JIRICO), Jindal Global Law School, New Delhi on Issues at the Interface of Technology, Patents and Competition Law on 11th April 2017. 15. Sri B. D. Paulson, DIG, Deputy Director, SardarVallabhbhai Patel National Police Academy, Hyderabad on Penal Law of India: Police Perspective on 20th April 2017. 1. Dr. P. R. SubasChandran, Messenger India Private Ltd, delivered a lecture on Attitude Alters Altitude on 15th July 2015. 2. Hon’ble Shri. U. Satya Rao, II Addl. District Judge, Visakhapatnam delivered a lecture on Anti-Ragging & Law for first semester students on 17th July 2015. 3. Shri. R.V. 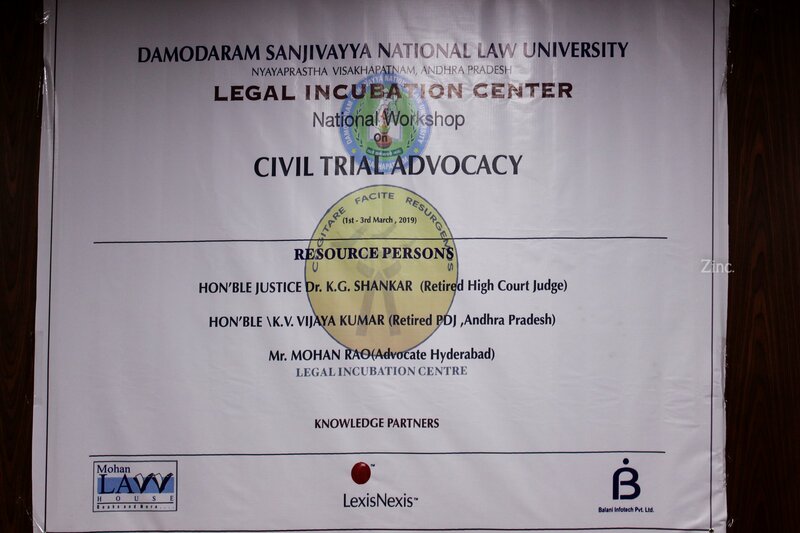 Naga Sundar, Secretary, District Legal Services Authority & Senior Civil Judge, District Court, Visakhapatnam delivered a lecture on Enlightening the importance of Legal Aid: Role & Aspects for first and third semester on 20th August 15. 4. Prof. DilipUkey, Department of Law, SavitribaiPhule Pune University, Pune delivered a lectures on Marxian Theory of Law, Feminist Legal Theory, Critical Legal Theory for fifth semester students from 10th& 11th September 2015. 5. 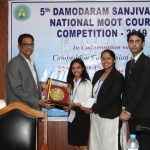 Hon’ble Mr. Justice S.V. Bhatt, Judge High Court of A.P delivered a lecture Environmental law for fifth, seventh and ninth semester students 19th September 2015. 6. Hon’ble Mr. Justice U.Durga Prasad, Judge, High Court of A.P delivered a lecture on Law of Injunctions and Appointments of Commissioners & Receivers firth semester students on 19th September 2015. 7. 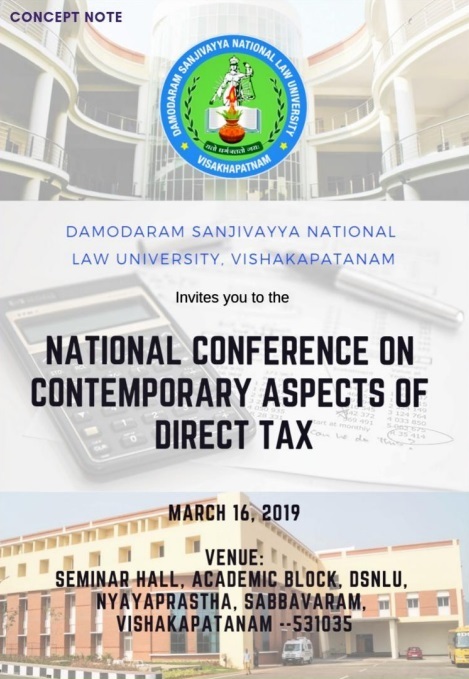 Prof. K. Srinivasa Rao, Dept. of Statistics, Andhra University, Visakhapatnam delivered a lecture on Quantitative Research for first semester students on 21st September 2015. 8. All India Yoga VidyaPranic Healing Foundation representatives have delivered a lecture on Pranic Healing for all the students on 23rd Sep, 15. 10. Prof. T.R. Subramanya, Vice-Chancellor, Karnataka State Law University, Hubli delivered a lecture on Extradition and Asylum, Diplomatic Immunity, Environment & International Law for the students of Fifth & Seventh semesters on 26th& 27th October, 2015. 11. Dr. J.S. Patil, Professor, Dept. of PG Studies and Research in Law, Gulbarga University, Karnataka, delivered lectures on Critical Legal Studies, Feminist Legal Theory, Postmodern Legal Theory for Fifth Semester students from 27th , 28th& 29th Oct, 15. 12. Prof. NishitaJaiswal, Punjab University delivered a lecture on Constitutional Law for third semester students on 31st October, 2015. 14. The Andhra Pradesh Police department officials have addressed the university on Awareness Programme regarding theft on 4th November 2015. 15. Mr. P.V. Ramakrishna Rao, Legal Advisor, Police Commissionarate, Visakhapatnam addressed the students on Examination of Witnesses from 08th& 09th Mar, 2016. 1. Hon’ble Shri. T. Venugopal Rao, Principal Senior Civil Judge addressed the students on “Anti Ragging Law- Its Implications & Violations” on 14th July, 2014. 2. Shri. K. Ranga Raju, Assistant Commissioner of Police, Madhurawada, addressed to students on “Anti Ragging Law- Its Implications & Violations” on 14th July 2017. 3. Prof. R K. Murali, Professor of Law, Banaras Hindu University, addressed the V semester students on “Industrial Disputes Act its Relevance” and “Human Rights – A New Dimension” addressed the VII & IX semester students from 23rd& 24th July 2014. 6. Dr. P. R. SubasChandran, Messenger India Private Ltd., on “Attitude Alters Altitude”on 20th September 2014. 8. Dr. D. Hanumanta Rao Audit & Accounts Compliancy by Companies- Role of Auditors Corporate Governance and Role of Board of Directors from 10th& 11th October 2014. 14. 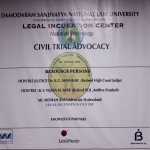 Mr. Badrinath, Advocate addressed the students of Fourth Semester on the topic “ Oral Documentary Evidence in Civil and Criminal Proceedings” on 17th March 2015. 16. Motivational Lectures by Dr. P. R. SubasChandran, Messenger India Private Ltd. on “Attitude Alters Altitude” on 24th March, 2015. 17. Prof. B.S.R. Rao addressed the students on “Law and Economics” from 6th to 8th April 2015. 18. Prof. Dabiru Sridhar Patnaik, Director, Centre for Postgraduate Legal Studies; Executive Director, Centre for South Asian Legal Studies Jindal Global Law School delivered lecture on ‘Globalism’ in Action and Legal Education: Tipping Points on 9th April 2015. 1. Hon’ble Shri K Surya Rao, District Legal Services Authority, Visakhaptanam addressed the students on Anti-Ragging Law on 3rd July, 2013. 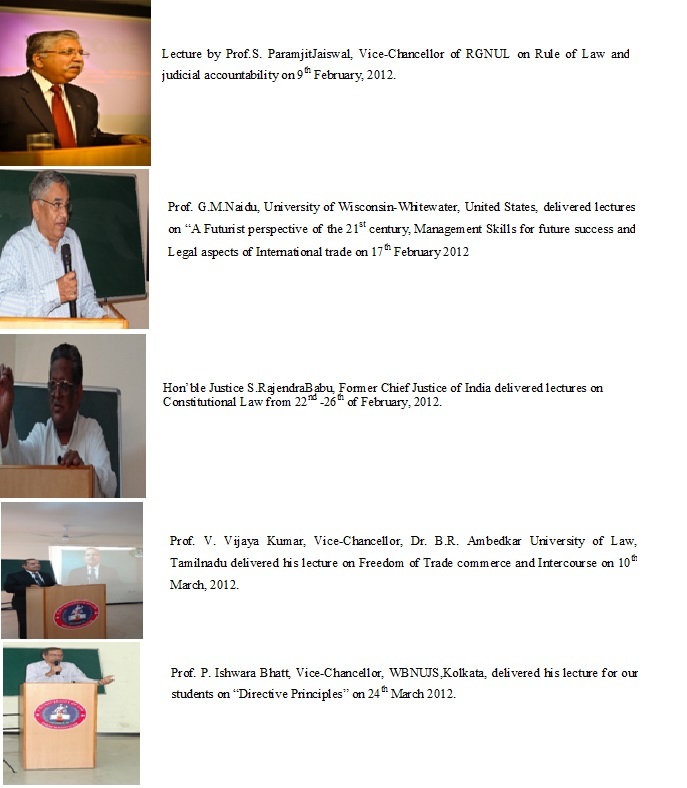 Prof. (Dr.) K N Chandrashekaran Pillai, Former Director, National Judicial Academy, Bhopal and Indian Law Institute, New Delhi on “Criminal Justice System – Analysis” and “Case Method of Learning” on 26th& 27th January 2014. 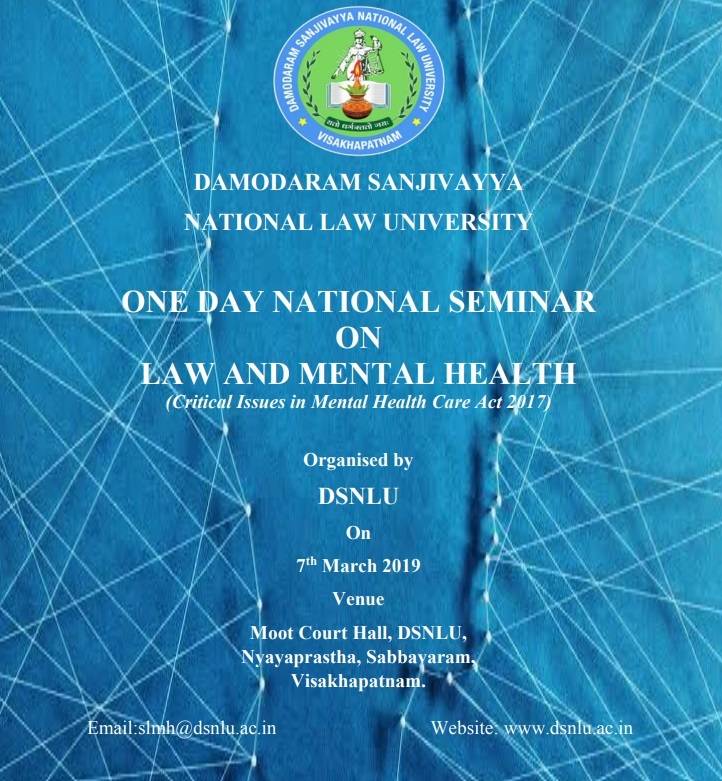 Prof.JankiAndhari, Professor, Tata Institute of Social Sciences (TISS), Mumbai on “Gender Issues – Challenges” and on “Disaster Management and Law” 20th & 21stFebruary 2014. Prof.Ellumali, Director, IGNOU “Securitization law” and Recovery of Debts by Banks” Analysis of Law on 27th& 28th February 2014. PurushothamAnand, NLU Delhi addressed the students on “Economic Analysis of Legal Process” for IV Semester students and “The importance of Legal research and Publication: A student’s perspective” on 27th March 2014. PadmashriProf.Kolakaluri Enoch, Former Vice Chancellor of SV University addressed the students on “The conflict of law and Practice” on 4th April 2014. Shri. 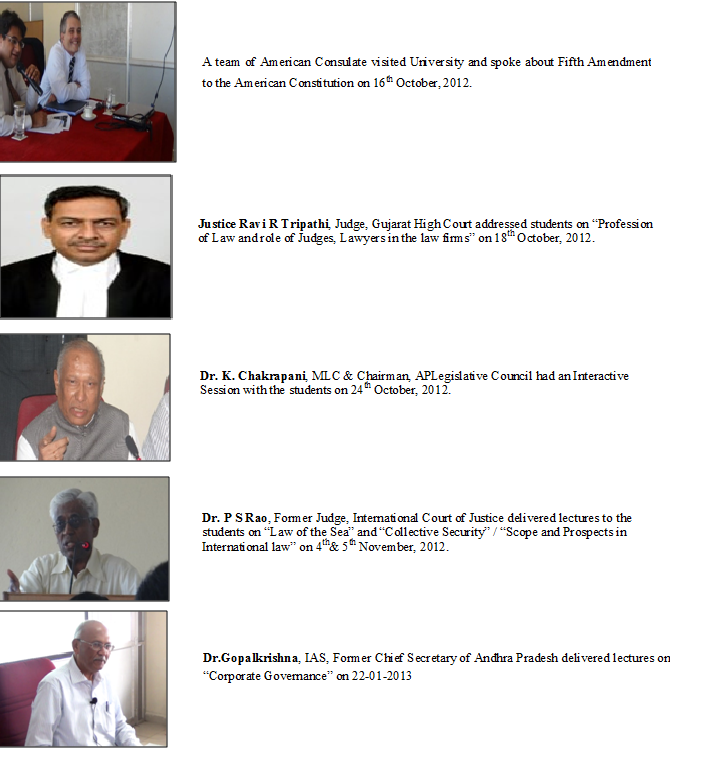 N.V. Badrinath, Advocate from the Bar Council of Visakhapatnam delivered lecture on Civil Procedure Code on 6th September, 2012. 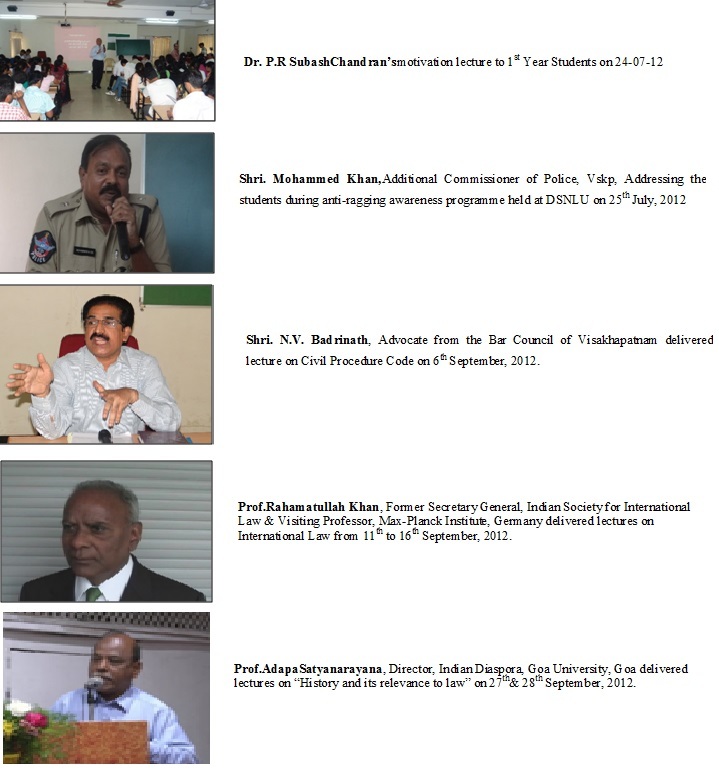 Prof.Rahamatullah Khan, Former Secretary General, Indian Society for International Law & Visiting Professor, Max-Planck Institute, Germany delivered lectures on International Law from 11th to 16th September, 2012.